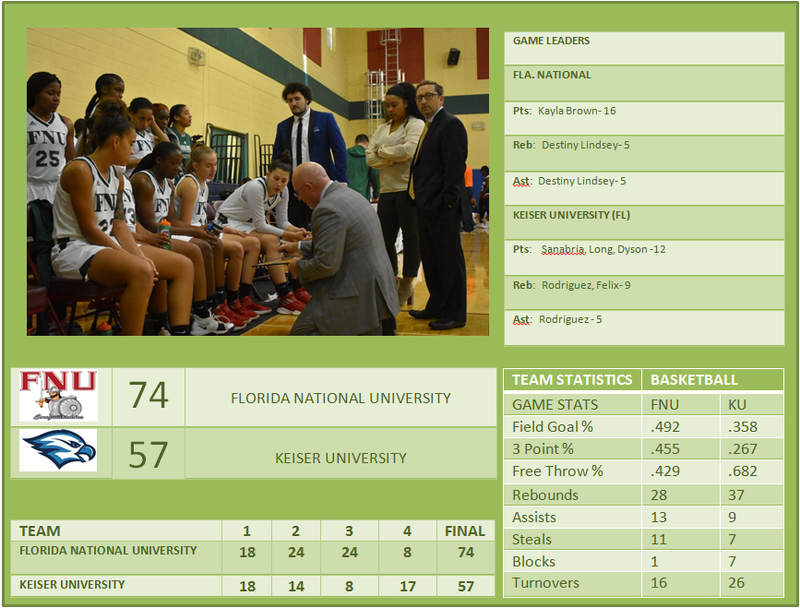 Hialeah, FL – Florida National University women’s basketball team beats Keiser University 74×57 in the first game between the two teams. Location: Bucky Dent Center, Hialeah, Fla.
Kayla Brown notched a 16 points, 2 rebounds and 2 assists. Brianna Richardson scored 14 points and got 1 rebounds. The Seahawks outrebounded Florida National 37-28 in the contest. The Seahawks evened the game with 6:05 remaining in the second quarter when FNU used a 10-0 run to take their first double digit lead of the game. The Seahawks jumped out to a 7-3 advantage and stretched the margin to a first half best seven, 12-5 with 5:49 showing. Florida National answered back with six straight points and turned it into an 11-2 run to claim a 16-14 lead at the 1:03 mark. The teams then traded baskets to head into the second quarter all-even at 18-18. Keiser tallied the first four points before FNU scored the next six points to jump ahead 24-22 with 7:23 remaining in the half. Following a basket from Sanabria to the tie game, the Conquistadors used a 10-0 run to take a 34-24 advantage with 4:26 to go. The Seahawks twice got to within eight before going into the halftime break trailing 42-32. FNU controlled the third quarter using an 18-3 run during the final eight minutes to lead 66-40 with one quarter left in the contest. Keiser regrouped in the fourth quarter by outscoring Florida National 17-8 but came up short on the evening, 74-57. The Conquistadors scored 30 points from downtown . FNU received 27 points from their bench this evening. FNU pulled down 6 offensive rebounds, leading to 12 second chance points. This was the first-meeting between these two teams in program history. FNU is now leading the confront 1-0. The Conquistadors will face Lynn University on Friday evening at Boca Raton with a tipoff of 5:00 p.m.